In 2089, Elizabeth Shaw (Noomi Rapace) and Charlie Holloway (Logan Marshall-Green) discover cave paintings on an archaeological dig that match similar ones found around the world, all of which seem to depict giant figures pointing at the a specific star system. A few years later, Shaw and Holloway are part of an expedition aboard the spaceship Prometheus, on a mission funded by Peter Weyland (Guy Pearce, in distressingly awful old-man make-up) to that same star system, and although the expedition was predicated on their theory that the paintings are an invitation from creatures that may have created humanity, they are informed by Meredith Vickers (Charlize Theron) that the expedition is a commercial venture, rather than a scientific one. Once they arrive at their destination, the nature of the mission quickly falls by the wayside as it becomes apparent that things are not as they appear. In the run up to its release, the main question being asked about Ridley Scott's Prometheus was whether or not it was a prequel to Scott's 1979 masterpiece, Alien. Now that question has been firmly, idiotically, laid to rest by the film itself, the question that now needs to be asked of Prometheus is whether or not its scope and style excuse its sloppy storytelling. Does its ambition excuse its execution? Whilst the look of the film - with its practical sets and black, organic-machine designs inspired by the work of H.R. Giger - hearkens back to Scott's earlier film, writers Jon Spaihts and Damon Lindelof reach even further back for the story, which is heavily reminiscent of Quatermass and The Pit and H.P. Lovecraft's "At The Mountains of Madness". As in those earlier stories, the characters go in search of some ancient secret, only to find something far deadlier than they ever expected. At its heart, Prometheus is about the search for God and importance/danger of the search for knowledge no matter the cost, though the sting in the tail is that, even though Shaw and her fellow scientists find their creator, they discover that it is an incredibly hostile one. It's an incredibly powerful and evocative idea - what if you went searching for God, and found out that He hated you? - and it's the sort of idea that studios would fight tooth and nail to keep out of a high-profile summer blockbuster. If there is anything admirable in Prometheus besides its visuals (and it really cannot be overstated how visually stunning the film is, even in 3D), it is the willingness of Scott and his writers to tackle ideas and concepts that would be focus grouped to oblivion ninety nine times out of one hundred. It takes considerable nerve to do what they have attempted: to create a contemplative science fiction story about scientists pursuing the meaning of existence and sneaking it into a more conventional horror narrative. But this is also the film's downfall since, whilst its ideas are ambitious and compelling, its screenplay is not. With the exception of Elizabeth Shaw, none of the characters are defined beyond the most rudimentary features, if they are defined at all. Whilst Idris Elba as the captain gets to have a Stephen Stills obsession to make him stand out, most of the characters are little more than anonymous figures who serve only to make the frame look busy before getting killed off, deaths which have absolutely no meaning because the characters themselves are meaningless, empty vessels. The few characters that are interesting, such as the android David (Michael Fassbender) are so oblique that they just become frustrating. Even when the characters are given some characteristic to define them, it is a flimsy sort that will be rejected as the plot requires. Case in point: A biologist (Rafe Spall) is unwilling to be in the same room as a dead creature, then is positively eager to spend time with a living, clearly hostile creature mere minutes later. It doesn't make sense for a biologist not to want to examine a dead, hitherto undiscovered species, but far less sense that they would then be fine interacting with a live specimen. Isolated moments of characters acting counter intuitively could be ignored, or at least explained away, if only every character didn't act as if they were all suffering from some profound, unexplained brain injury. None of them react in ways that make sense, either from a narrative or character point of view, to the events around them, and every time that they act in some counterintutive way, it chips away at the already gossamer thin suspension of disbelief required of the audience. It even detracts from the power of the film's strongest moments - such as a particularly traumatic "birth" scene - by making them feel completely isolated from everything else around them. There is no cohesion to the story, and with nothing holding the centre together, it's all too easy to see the massive gaping holes around it. This, in turn, prevents the film from being satisfying as anything other than a dry intellectual exercise. If that was all that it was trying to be - if Scott was making something akin to Tarkovsky's Solaris - that would not be as big of an issue, but Prometheus is also meant to be entertaining as well, and its characters make decisions that are too distractingly dumb and non-sensical for it to rise above being a slasher movie with pretentions. 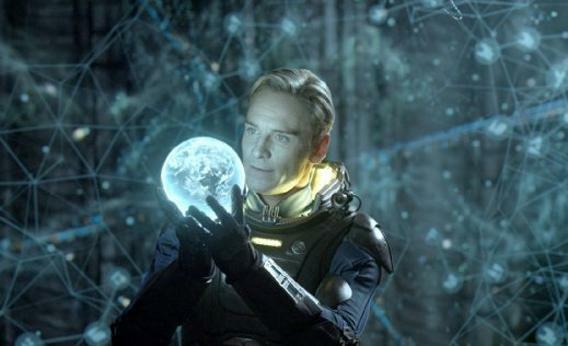 Prometheus is a film that swings for the fences and misses badly. Whilst that doesn't mean that the effort shouldn't be lauded, that effort is simply not enough to excuse its many flaws. Whilst it is visually and thematically arresting, its story, characters and basic storytelling are borderline incompetent. For all its admirable qualities, Prometheus isn't entertaining or interesting enough to be anything other than an unusually bold curio. Perhaps, in the end, the film was named after the wrong Greek myth: instead of Prometheus, Icarus may have been more appropriate.